Marla worked in hospitality and struggled to find a good paying job. At her initial Re-employment Services (RES) appointment, she said her husband is a truck driver and she would be interested in getting her Class A CDL. She attended a Job Search Assistance Program class to prepare her for future interviews, filling out applications and putting together a resume. Upon completion of her assessments and interest survey, DLR determined truck driving would be a good fit. Marla completed all the requirements to enroll at a technical school to begin working on her Class A CDL. Marla also attended a financial literacy class to ensure she would have the financial means to take care of her finances while training. Marla completed her CDL in May of 2018. She was immediately hired by a trucking company in June and started fulltime in July. She really enjoys her new job and is very pleased with the opportunities DLR provided for her. Peggy began working with Aberdeen DLR to secure an office position. She had experience in receptionist and legal secretary work. Peggy completed the National Career Readiness Certificate, attended a Job Search Assistance Program class, received one-on-one job search assistance, resume/cover letter assistance, and direct referrals to reliable positions in the community. She obtained a full-time reservation sales associate position at Wyndham Hotel group. Six months later the company announced it was permanently closing. Her job was being outsourced to foreign competition. Three employees from Wyndham submitted petitions and were awarded benefits from the Trade Adjustment Act (TAA). DLR staff and Peggy worked closely to determine what she wanted to do. Todd owned his own business for many years and was forced to close. DLR got to know Todd better by helping provide information at a Rapid Response. Once the business was auctioned off, he came to DLR for help. Todd’s goal was to find employment where he could either find a job using his mechanic degree or his CDL. The biggest challenge was finding employment flexible with Todd’s daycare provider. Todd’s daughter was a huge reason on why he wanted to stay in the same location, plus Todd had family support nearby. Todd applied for the TANF program. He was required to work 20 hours per week at a community service site and complete one hour of Job Search. The Employment Specialist assisted Todd with job referrals, resume preparation and enrollment in WIOA. On average, Todd would apply at three jobs per week. Todd posted his resume on SDWORKS. An employer who didn’t have a job posted publicly in SDWORKS found Todd’s resume and requested an interview. Todd got the job three weeks after applying for TANF. DLR also helped Todd through support services, such as getting work attire and appropriate shoes for his new job. When Melissa came to DLR, she had no idea what she wanted to do. She had a poor work history and limited income. Based off information she provided, DLR referred her to Vocational Rehabilitation Services, but assessments revealed that she did not qualify for their services. To figure out what she might like to do, she completed an interest assessment at My Next Move and DLR went over the results with her. Melissa's first choice was a receptionist or clerical worker, but only because she wanted to work during the day and dress up. Melissa scored high in the Artistic category on the interest assessment and chose to job shadow at a local flower shop. The shop was too chaotic for her, so next she explored her interest in baking and decorating by visiting a local business that served limited lunches and made and decorated cupcakes. Melissa didn't think it was the right fit either. She had talked about working with her dad, who is a carpenter, so DLR contacted a local cabinet building shop. Melissa’s interest while touring the shop could be seen and heard in the questions she asked. DLR started to plan a Work Experience that day. Melissa completed the work experience and received a job offer, but she still needed a lot of training. 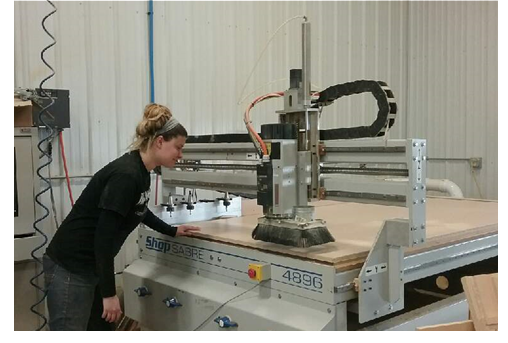 DLR offered a 480-hour On-the-Job Training (OJT), which Melissa completed in April 2018. She is now a full-time employee. Brett had a stroke about three years ago that affected his left side. He is unable to use his left arm and uses a cane. He has about one year of college training in computer science. Brett had not worked since August 2014 and was referred by Vocational Rehabilitation Services. DLR assisted him with his resume, interviewing skills and employment plan. He wanted a position as a computer technician or a human resources, library or office position that matched his physical abilities. DLR referred him to several jobs at businesses and after discussing openings at a local monument company, he applied on his own for an office assistant position there. DLR and Vocational Rehabilitation Services contacted the employer to set up a possible On-the-Job Training (OJT); the employer agreed to a 117-hour part-time OJT position as an office assistant. DLR helped complete a a Work Opportunity Tax Credit (WOTC) certificate for the employer. The employer was impressed with DLR services and was interested in setting up other possible OJTs with other job seekers in Chamberlain and Pierre. Brett started his position in March 2018, and is doing great. He and the employer provided positive feedback during the first monitor. He has learned new skills such as answering the phone, assisting customers with orders, and sending out letters to potential customers. Brett has enjoyed learning about all the memorial headstones and designs. Black Hills Special Services assisted him with reporting his income to the Supplemental Security Income (SSI) program. Dakota Link provided an adaptive technology assessment and helped him with voice recognition software. Brett also adjusted his computer to expand the memory to download the new software into the system. Read more Showcase of Successes in our archive.